It's December again... I love December... I love all the Christmas lights that went up in our neighborhood the day after Thanksgiving... I love all the parties and special events that make the month go by so fast... I love all the yummy treats that find their way into my tummy each and every December. But above all, the thing I love the most about December is teaching my kids about giving. We've started a few traditions around here to help them not only learn about giving but hopefully they can experience the great joy that comes when we give with a cheerful heart. Today was Blessing Box Day... Each December we wrap a a large cardboard box with fun Christmas paper. 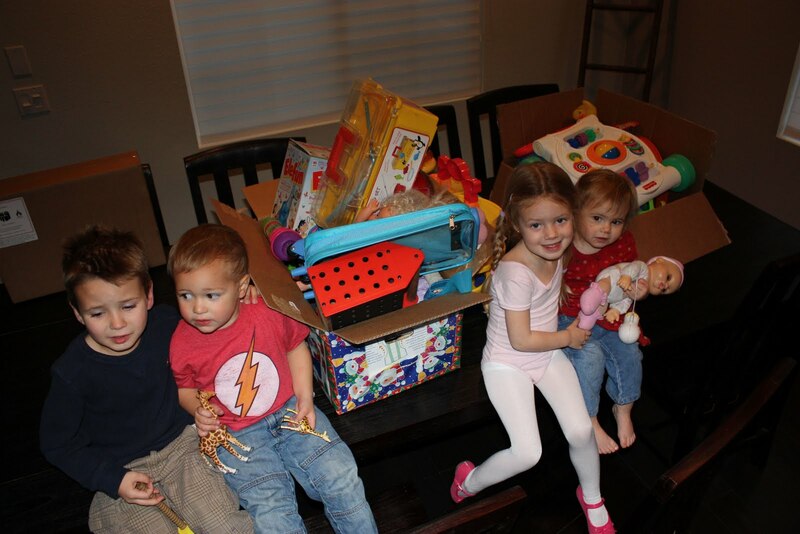 While we're wrapping we talk about kids around the world that don't have a lot of toys like we do... and we encourage our treasures that even though they are young they can still take part in blessing kids all around the world. We have them pick toys that they want to give away to kids who need them more than we do. We encourage the kids to pick "the best" things to bless these kids with. We talk about how God gave us HIS BEST when he gave us his Son and how when we choose to bless others we should bless them with the best things that the Lord has blessed us with and not just give our "leftovers" or the things that we don't really want. This year was AWESOME with Siah! After we wrapped the box he went and picked two of his most favorite things and didn't stop there. He was more than generous... some things that he picked I didn't even want him to give away... but I was grateful to be witnessing his giving heart so I let him put whatever he wanted in the Blessing Box. "Mama, I sure hope those kids like the things I picked out for them." I think he really gets it! The Blessing box is one of my favorite things to do with my kids. Hal is still learning and Reesie has no clue, but we take the time to explain and encourage them each year whether they fully get it or not. And this year I was super blessed to see Siah's heart for kids he's never even met. This year's Blessing box was a total blessing!!!! AJ even joined in the fun! !